In just 15 minutes you can be enjoying these dinners. Classic Elegance Sampler. Start this sampler off with a gourmet steak dinner. Then continue with the delicious authentic Mediterranean Chicken Meal, Traditional Lasagna Dinner, and for a home-cooked taste, you can savor the Boneless Pork Chop Platter. All meals are ready to in just 15 minutes or less. Do Not Thaw! Microwave: Remove chicken breasts from bag. Place one chicken breast in microwave safe dish. Cover with paper towel Heat on HIGH for 2 - 2� minutes. Oven: Preheat oven to 400 �F. Place desired number of chicken breasts on foil lined baking sheet. Heat for 12-15 minutes. Thaw and Serve: Chicken breasts may be thawed, sliced and served cold. Thaw in refrigerator. Grill: Preheat grill. Remove pork chops from package. Pat dry, season as desired and cook over medium heat for approximately 4-7 minutes per side until internal temperature reached 145 �F. Broil: Preheat broiler. Remove pork chops from package. Pat dry, season as desired. Place on broiler pan 3-4 inches from heat source. Broil 4-7 minutes per side until internal temperature reaches 145 �F. Contact Grill: Preheat contact grill. Season thawed pork chops. Grill 4-5 minutes for a 4 oz. chop; 5-6 minutes for a 5 oz. chop; 6-7 minutes for a 6 oz. chop. 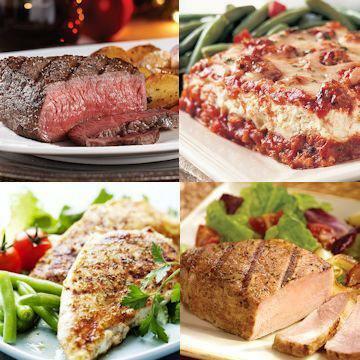 Beef, Pork, Lamb, Veal and Poultry have been born, raised and harvested in the USA. From Frozen: Oven: Preheat oven to 350�.Carefully remove film from tray before baking. Place frozen tray of lasagna on a baking sheet in the center of the oven. Bake 55-60 minutes or until internal temperature reaches 165�F. Remove from oven and let stand 5 minutes. Slice and serve Microwave: Remove tray from box and cut small slit in center of film. Place frozen tray in microwave and cook on medium high for 9-10 minutes or until internal temperature reaches 165�F. Remove from microwave with oven mitts and let stand 5 minutes. Carefully remove film, slice and serve. From Thawed. Thaw in refrigerator overnight.Oven: Preheat oven to 350�.Carefully remove film from tray before baking. Place tray on baking sheet in the center of oven. Bake 35-40 minutes or until internal temperature reaches 165�F. Remove from oven, slice and serve.Microwave: Remove tray from box and cut small slit in center of film. Place thawed lasagna in microwave. Heat on high for 4-5 minutes or until internal temperature reaches 165�F. Carefully remove film, slice and serve. Do Not Thaw! Microwave: Cut slit in center of film. Place tray in microwave; cook on high for 2-3 minutes. Carefully remove film, stir and cook on high for 1-2 minutes or until internal temperature reaches 165�F. Stir and serve. Oven: Preheat oven to 350�F. Carefully remove film from tray before baking. Place tray on baking sheet on oven center rack. Bake for 35-40 minutes or until internal temperature reaches 165�F. Remove from oven, stir and serve. �Bake: Preheat oven to 350� F. Remove potato from package. Place desired number of frozen portions on an ungreased baking sheet. Bake 40 minutes, until heated through and lightly browned. Grill: Preheat grill. Remove potato from cellophane package. Place frozen potatoes on a sheet of aluminum foil. Wrapping foil around potatoes, leaving top half exposed. Grill on medium-high heat. Cook with grill lid down for 35 to 45 minutes. Microwave: Remove potato from wrap. Place one frozen potato on microwave safe dish. Cook on high for 21/2 to 4 minutes rotating at half way point. To cook two potatoes, increase cooking time to 4 to 6 minutes.